CURTC Finals day…. 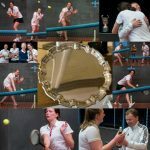 TAGS: Category | Finals Day | HRFP …sponsored by Hannay-Robertson Financial Planning Click on the Thumbnails for much larger images! from the 2017 Pol Roger Trophy Final TAGS: Ed | Pol Roger | RTC Click on the Thumbnails for much larger images! Pol Roger Trophy Final @RTC TAGS: Ed | Jamie | Pol Roger | Queens | RTC The CURTC Stream Team were at Hampton Court on Sunday for the Pol Roger Trophy Final where the Home of Real Tennis took on the Queen’s Club. Pol Roger Trophy Final CURTC will be playing the Queens club in the Pol Roger trophy final, starting at 10am on Sunday 12th March at Hampton Court Palace. CURTC Ladies vs Middlesex Ladies TAGS: Amanda | CU Ladies Old friends, new friends and epic rivalries continue at Middlesex. On Saturday 18th February the CURTC Ladies’ Team took on MURTC Ladies’ Team at Middlesex Court.